Vertoz recently shook hands with GeoEdge, a premier provider of Ad security and verification solutions for the online and mobile advertising ecosystem. Countering the recent series of cyber-attacks, this partnership will provide visibility and perfect publisher and user interest. Vertoz being a programmatic advertising company, and a part of the supply chain between the vendors and issuers has been keeping track of the various Ad frauds, Malvertising and other cyber-attacks that has been affecting the mass amount of users. GeoEdge ensuring the clean, safe and engaging user experience will help Vertoz in smoothing its customer experience. GeoEdge is the perfect partner for us as it focuses solely on AdTech companies. They understand the unique challenges and issues affecting partners’ ecosystems and provide comprehensive solutions needed in line with our business whether header bidding, open RTB, native and video ads. They also provide the best-in-class anti-malware engine which helps us keep our partners safe.” added Shah. “The digital ad space is exposed and vulnerable to threats from malicious actors. 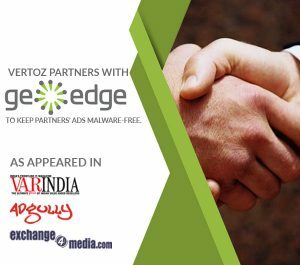 We are happy to partner with Vertoz, a company committed to malware-free and high ad quality ad serving for their partners,” said Amnon Siev, CEO of GeoEdge.